Turkish bath (Hammam) is the Middle Eastern variant of a steam bath. These were usually set up next to hot springs or in large cites where people would come to have a spa like experience. The traditional hammams are either for men or for women although in some couples or families can rent rooms. 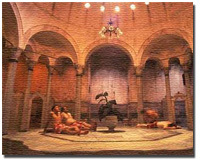 Europeans learned about the Hammam through their contact from the East hence the name Turkish bath.